When Ford Motor Co. cut its stake in Mazda Motor Corp. to 13 percent from 33.4 percent in November, several key Ford Motor Co. executives on loan to Mazda had to make a decision: Stick with Mazda or go back to Ford. 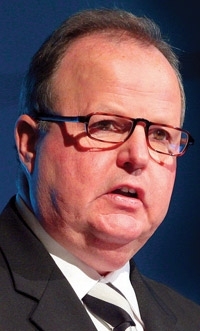 One of Mazda's coups was hanging on to Ford lifer Jim O'Sullivan, who had been CEO of Mazda North American Operations since 2003. O'Sullivan has been a key figure in the revival of Mazda's fortunes in North America, overseeing sales growth and the controlled reduction of the dealer body to emphasize exclusive showrooms. O'Sullivan, 56, spoke last week with West Coast Editor Mark Rechtin. What is your assessment of the first four months of 2009, and what will the rest of the year bring the industry? The way business was 12 months ago won't come back. The industry will come back, but there will be fewer dealers with more throughput. We are seeing more conservative manufacturing planning. I am thinking we'll see a 10 million SAAR [seasonally adjusted annual rate] for the whole year, with things picking up in the second half. As we get into 2010, the Japanese brands will see less incentive spending than we see now. We are going to clean everything up before we get to September. We ended the fiscal year [March 31] cash positive. We're putting incentives on to get port stocks down and get production down. Now we are seeing the pendulum swinging the other way. We've kept our head down. We have gone through a restructuring here, cutting about 120 positions, but we started doing that in the fall. Our r&d budgets were not cut, our cycle times not extended. Our product program has not been whacked. We are still focusing on introducing new products. We're talking engine technology, where gas engines get diesel mileage and diesels get hybrid mileage. We're talking a 30 percent improvement by 2015. It's not that we're not going through heartburn, but we're in a position where we'll be able to weather it. If we can get through this, think how well we'll be positioned when things get better. But we have some work to do. How do you see things on the manufacturing side? In the fall of last year, we started ripping out production between small cars and crossovers. It got too volatile, so we cut back. Our footprint was relatively small to begin with. We do have the plant here in North America, and over the last several years we've just maximized our existing footprint rather than adding another 300,000 units with a new plant all of a sudden. So we were in a position to weather this thing. What are you doing to reduce day supply? We're trying to keep it at 60 days supply for the dealers. But you also have to look at what's on the water and what's at the port. Days supply is just what's in dealer inventory. We were already taking steps to reduce the pipeline. Our days supply at the port is under 10 days. Our production is order-to-build. What's on the water is basically sold dealer orders. We're not building orders and then fencing them. When will we see a turnaround? People are coming into the real estate market to buy land at value prices, and it's usually two or three years out before they can break ground. It's an early sign. I see the credit markets easing up a little bit. Banks don't make money unless they loan money. Dealers are getting robust used-car markets. The availability of vehicles at auctions is getting a little lean. We're seeing less repurchase, less turn-in, and scrappage is higher than manufacturing. That has the impact on residuals coming up. When that happens, the new-car market will start moving a little bit. Next spring, I see the normality being 11 million, maybe a little more than that. What percent of your dealers are profitable right now? I won't give you a number, but let's put it this way: Our network is in fairly good shape. We had 900 stores six or seven years ago, and we've managed it down to 640. We've lost a couple handfuls of dealers in the current economic climate who have closed. In some cases, that was not a result of Mazda. It was other brands that went down, or the dealer got too leveraged or stressed and the store cratered. We may only lose another handful. And we have people standing by waiting to pick up the Mazda franchise. Are you changing any of the rules behind the Retail Revolution facility renovation plan as a result of the economy? We never have said, 'You need to build new buildings.' Only about 10 percent of our dealers have gone Retail Revolution. We're being cautious. We want to support a dealer to go exclusive, but let's make sure the conditions are right before they do it. We don't want them to build a new building if it means a higher rent factor. How has the relationship with Ford changed now that it does not have a controlling interest in Mazda? Ford still is our largest shareholder. If Ford didn't want to continue to have a good relationship, they could have sold the rest of the stock. We have AutoAlliance in Flat Rock [Mich.] and in Bangkok and our shared facilities in China. Those relationships are still there. We are still looking at powertrain and product development opportunities where it fits both brands. Phil Spender is a Ford corporate officer in Hiroshima to make sure the relationship is still there. But there are some Mazda positions that can no longer have Ford employees in them due to Sarbox [Sarbanes-Oxley] and J-sox [Japanese version of Sarbanes-Oxley] regulations. Late last year, Mazda shifted from Ford Motor Credit Co. to Chase Auto Finance as its primary retail lender. How is it going with Chase? Our relationship with Chase is very good. There was some anxiety among dealers when we made the switch, but Chase has good relationships with the dealers and has been in auto financing for years. They got out front and brought in dedicated people. I think we've done a good transition for APR subvention, and, yes, we're still in leasing. The other piece is that we're in the process of segueing the floorplanning from Ford Credit. Here we are in the tightest credit market ever. Do dealers want us to buy lower paper or have lower rates? Sure, but we're not getting complaints. Mazda recently launched the redesigned Mazda3, your best-selling car. How is it doing? It's a little early to tell. A lot of the source of sales is existing customers, but we're also seeing cross-shop with Toyota, Nissan and Honda. We just asked for more production. The Mazda6 is also a new model, yet its sales are off dramatically. What can you do? The enthusiasm among dealers is still really strong. They know we've launched in a perfect storm. So instead of burying dealers in inventory, we slashed the heck out of production to protect the residual value. The fastest way to kill a car is to bury a dealer with 150 of them when he's selling five a month. And we didn't fleet a bunch of cars. As we come into the 2010 model year, we're looking at how can we repackage it to provide more value. The new Mazda2 just was voted World Car of the Year, but it's not sold here. Are you any closer to bringing it here? Would it cannibalize the Mazda3? We're still studying whether it comes to North America. It's too early to make any announcements. We are looking at it for Canada. If we were to bring it over, I don't think it would cannibalize Mazda3 that much. But for right now, our focus is the launch of the Mazda3 because that's our heartbeat. We think Mazda2 is a great car that fits in the portfolio, but not right now in North America. Two or three years ago, you were trumpeting Mazda's entry into crossover vehicles in a big way. But sales of the CX-7, CX-9 and Tribute are off 46.5 percent through March from last year. Do you regret putting so much of your development budget into those segments? They are still very important. The great thing about Mazda is that we build a variety of products at one plant. With a flexible plant, we have CX-9, Mazda6, RX-8 and Miata on one line, which lets us keep our costs down. When the market comes back, people's lifestyles change. We're also putting a naturally aspirated 2.5-liter engine in the CX-7 to carve out some volume. And if other brands go away, if we get on their shopping lists, that helps us, too. There is still a need for seven-passenger vehicles and good five-passenger vehicles in the crossover segment. Will you delete the Tribute SUV from your product lineup? Sales are particularly slow. There still is a need for Tribute. It's regional, mostly in the Gulf and Southern states, and we don't put many resources behind it. Mazda talks about how important customer service is. Yet Mazda finished second to last in this year's J.D. Power customer service index. How do you reconcile that? We said, "Let's work on our diagnostic tool, not chase a number." So we took the customer service bonus money and put it back into the invoice. We rolled it back in. Now we have a new diagnostic tool that gives us a better look at customer service. However, if you look at Consumer Reports, we're the fourth-ranked brand, so there's a disconnect somewhere. Still, we need to continue to work on customer service.